Susanna Inge came to fame as secretary of the City of London Female Chartist Association, but this was just one episode in a long life. This is her life story. Susanna Inge: a family photograph probably from the 1870s. Copyright reserved. 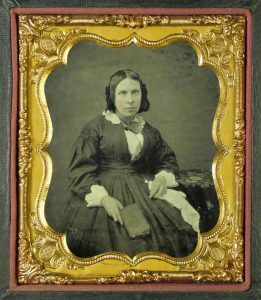 For the best part of two years, Susanna Inge was a Chartist sensation – an outspoken young woman, unafraid to take to the public stage or to the written word to argue the case for Chartism and for women’s right to a voice in politics. First coming to public attention with an address “to the women of England” which appeared in the Northern Star (2 July, 1842), Susanna Inge was already signing herself a “Member of the Female Charter Association of the City of London”. “as civilisation advances man becomes more inclined to place woman on an equality with himself, and though excluded from everything connected with public life, her condition is considerably improved”. “assist those men who will, nay, who do, place women in on equality with themselves in gaining their rights, and yours will be gained also”. What happened next, however, raised Susanna Inge and her fellow female Chartists to a new level of notoriety. Since Susanna Inge had written to the Star some months earlier on behalf of just such a body, this was presumably an attempt to give it some public momentum. As was typical with many female Chartist meetings, the chair and both main speakers were men. The meeting did not go entirely to plan. One speaker, a Mr Cohen, declared that he “did not consider that nature intended women to partake of political rights”. He argued that women were “more happy in the peacefulness and usefulness of the domestic hearth, than in coming forth in public and aspiring after political rights”. This created , in the words of the Northern Star’s reporter a “sensation among the ladies” (Northern Star, 22 October 1842). Though no response is recorded from Susanna Inge, her fellow Chartist Mary Ann Walker was having none of it. She was, she declared, “astonished at the question”. Susanna Inge (or Susannah, as she was sometimes reported, although she herself did not sign her name with an H) proved to be in demand as a Chartist lecturer, speaking on the ill-treatment of working people and on the Charter as a remedy for society’s ills (Northern Star, 5 November, 1842). “woman ought to be better educated, and that, if she were, so far as mental capacity, she would in every respect be the equal of man”. All of this played well with the Chartist leadership. But Susanna Inge was not content to be a mere propagandist. She had ideas on how Chartism might be better organised, and was keen to share them with the wider movement. In one letter to the Northern Star (17 December, 1842), she suggested that every Chartist locality should have its byelaws and plan of organisation hung in a prominent place, that these should be read before every meeting, and that any officer who failed to abide by them should be called to account. Although Susanna Inge continued to lecture in the Chartist cause (a meeting at the Working Man’s Hall at which she was to speak was advertised in the Northern Star of 26 August, 1843), she had clearly overstepped the mark. The final mention of her name in print is a brusque note in the Northern Star of 14 September, 1844 that the editor could not undertake to publish letters he had not yet seen, “and this is a rule that even gallantry in Miss Inge’s case is not strong enough to break through”. But who was Susanna Inge? Her background, and what became of her after her high-profile involvement in Chartism came to an end, have long been a mystery. However, thanks to the work of Lorna P Cowan, a distant relative of Susanna, the mystery has been solved. Susanna Inge Austin was born in Folkestone in 1820, and was baptised there on 9 February. Her father Richard Inge Austin was a plumber, glazier and painter, who had married Mary Ann Kite in September 1819 – apparently after she fell pregnant. Susanna Inge Austin baptism record. Click the picture for a larger version. Some time in the next few years, the family moved to London, and dropped the surname Austin. Susanna’s younger brother, born in 1831 in Holborn, was named John Inge and by the time of the 1841 census the whole family was using that surname. When she was 16, one of her uncles, learning that she could not write, bought her a copy book. He was evidently angry at this lack in her education and asked her to write to him. Other members of the family are to be found in London at the time of the 1841 census, but Susanna Inge appears to have returned to Folkestone, where she was working as a family servant in the household of a linen draper in Broad Street. She clearly moved back to the capital fairly soon afterwards as she was involved with the City of London Chartists the following year. In addition to the reports of her political interventions, some newspaper reports of the time also give a glimpse into Susanna Inge’s other interests. One account of a Chartist meeting (Morning Post, 30 November 1842) attended by men and women at the National Charter Association Hall at Old Bailey, notes that she “was engaged during the evening in drawing profiles on the blotting paper”. Perhaps by now she was beginning to tire of the organisation, or with her fellow Chartists. An extraordinarily snide account of a meeting soon afterwards claims that Mary Ann Walker spent an hour trying to sell lithographed portraits of herself at 6d each, and then talked so much that she had to be asked “to hold her tongue” (Hereford Journal, 8 February 1843). Susanna Inge attempted to turn her hand to writing. Much later, in a letter to her niece Jessica Inge, Susanna recalled that George Reynolds, the Chartist and editor-proprietor of Reynolds’ Miscellany, had rejected a piece she had written, advising that she try a better class of magazine “for which its style was more suited”. What happened next, however, changed the course of Susanna Inge’s life. On 18 February 1847, she gave birth to a son. All the evidence suggests that the young James McGregor was born outside marriage. There is no sign of a marriage having taken place. No father is listed on the birth certificate and Susanna reverted to her former surname of Inge Austin to register the birth. Subsequently, Susanna would call herself McGregor or MacGregor, and always referred to herself as a widow – for example, in the 1851 census. Her father Richard had died earlier that year, and the family were then living at 10 Dorrington Street, Clerkenwell, with Susanna recorded as working as a “furrier finisher”. Susanna MacGregor in the 1851 census. Click the picture for a larger version. Life cannot have been easy. In 1857 Susanna MacGregor and her son emigrated to New York, settling in Brooklyn, where she found work as a fur sewer. Some years later, as the 1870 US census shows, Susanna’s mother Mary Ann Inge, joined them. But the former Susanna Inge kept in touch with the family of her younger brother John, sending letters, stories and poems to her nieces Alice (born July 1870) and Jessie (born May 1873). These papers are now held by Lorna P Cowan. A poem sent by Susanna with a handwritten note to her niece Jessie Inge. Click the letter to see a larger version. One poem, shown here, dated 1841 but sent many years later, has a handwritten note saying that it has been sent “For Jessie’s birthday”. Later still, in a letter to Jessie dated 2 October 1895, a now elderly Susanna MacGregor spoke about her life in America. She had, she said, worked hard, but did not earn much and had very little time for expanding on her writing. Her work was rejected by a popular magazine as, so she was told, the prose was too difficult for its readers. Even so, Susanna lived on into the 20th century. She died on 26 December 1902 at 223 Bridge Street, Brooklyn, New York, at the age of 82.